Because colors are one of your blog’s most stand-out assets, you want to keep the shades you selected consistent. You’ll find a reference of your blog’s color palette to be an especially handy tool, and your style guide is the perfect place for this color reference. When listing your colors in your style guide, show the colors and list the technical specifications for each color you use. Showing the colors: Most word processors enable you to add a square shape and fill it with color. To get the exact colors, look for a Custom Colors option or something similar among the formatting options for a shape. You can use the Colors dialog box in Microsoft Word for the Mac 2011 to add the color squares like those shown. 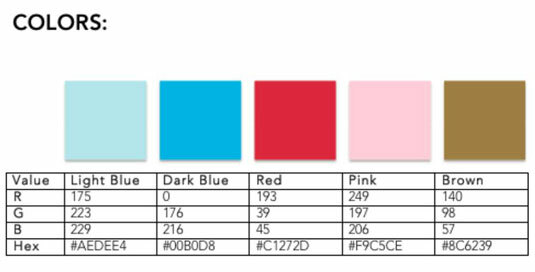 Listing the technical specs: On the web, colors are specified using RGB values or hexadecimal codes. Include both the RGB and the hexadecimal value for each color. 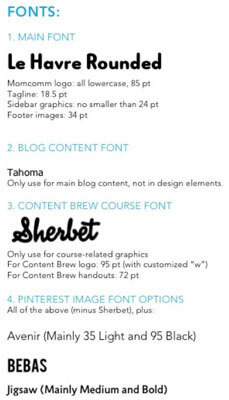 Like colors, the fonts you use on your blog can make your blog design more memorable. You probably use more than one font on your blog, so for this part of your guide, display the fonts that you use for specific areas of your site. If you’ve played around with your fonts and know at what font size they look too gigantic, you may want to also note that in your guide. The same goes for the minimum size to use before your font becomes hard to read.